Italian test pilot mission specialist astronaut 1998-2016. Italian Air Force. Status: Inactive; Active 1998-2016.. Born: 1964-10-15. Spaceflights: 3 . Total time in space: 35.52 days. Birth Place: Viterbo. BIRTHPLACE AND DATE: Viterbo, Italy, 15 October 1964. EDUCATION: Vittori graduated from the Italian Airforce Academy in 1989. Between 1989 and 1990 he completed his basic training with the U.S. Air Force at Reese A.F.B., TX, USA. On 15 December 1995 he graduated from the U.S. Navy Test Pilot School, and was recognized with the "Honor Student Award" for class 108. Between 1996 and 1997 he attended the Accident Prevention course (Guidonia A.F.B., Italy) and Accident Investigation course (Kirtland A.F.B., NM, USA). RECREATIONAL INTERESTS: Jogging, playing soccer, reading. EXPERIENCE: With the Italian Air Force, he acquired from 1991 to 1994 an operational background flying Tornado GR1, qualified for day/night air-to-air refueling as well as formation leader. In 1995, he was employed in the Euro Fighter 2000 programme, as project pilot for the Test Centre of the Italian Air Force and in 1996, he worked in the Beyond Visual Range Air-to-Air Missile (BVRAAM) Project for the development of a new missile to be used with the EF2000. In parallel he was teaching aerodynamics in the Italian Air Force's Accident Investigation course. Vittori has logged 1500 flying hours on over 40 different types of aircrafts. His flying experience also includes gliders and helicopters. Selected by the Italian Space Agency (ASI), in cooperation with ESA, Roberto Vittori joined the European Astronaut Corps and entered the Mission Specialist Class at NASA Johnson Space Center in Houston, USA, in August 1998. 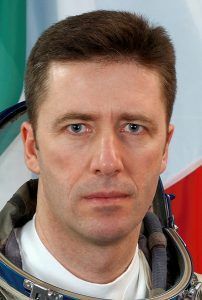 Roberto Vittori is one of a number of astronauts from European national space programmes who were being integrated into ESA's single European astronaut corps. ESA astronauts would be involved in the assembly and on-board operations of the International Space Station, a multinational programme that was to place a permanently inhabited facility in Earth orbit. MILITARY BACKGROUND Active duty, major in Italian Air Force. Family: Astronaut. Country: Italy. Spacecraft: ISS. Flights: Soyuz TM-33 ISS EP-2, Soyuz TM-34 ISS EP-3, Soyuz TMA-6 Eneide, STS-134. Agency: Italian AF. Bibliography: 6156. Birth of Roberto Vittori - . Nation: Italy. Related Persons: Vittori. Italian test pilot mission specialist astronaut 1998-2016. Italian Air Force. 3 spaceflights, 35.5 days in space. Flew to orbit on Soyuz TM-34 (2002), Soyuz TMA-6, STS-134..
2005 February 4 - . 2005 April 1 - . 2005 April 8 - . 2005 April 14 - . 2005 April 16 - . 2005 April 22 - . 2005 April 24 - . International Space Station Status Report #05-22 - . Nation: USA. Related Persons: Chiao, Krikalyov, Phillips, Sharipov, Vittori. Program: ISS. Flight: Soyuz TMA-5, Soyuz TMA-6, Soyuz TMA-6 Eneide. Landing of Soyuz TMA-5 - . Return Crew: Chiao, Sharipov, Vittori. Nation: Russia. Related Persons: Chiao, Sharipov, Vittori. Program: ISS. Flight: Soyuz TMA-5, Soyuz TMA-6, Soyuz TMA-6 Eneide. 2005 April 29 - .